Novo I & Novo II form a collection of three towers atop Burnaby Mountain and are part of Univercity at Simon Fraser University (SFU). Built by renowned developer Intergulf in 2007, these towers were designed to showcase the beautiful panoramic views to the North and East. All suites come with gourmet kitchens featuring oak veneer cabinets with brushed chrome handles, granite countertops, center islands with breakfast bar, black and stainless appliances and a double stainless steel sink. Other finishing include marble countertop with vanities, stainless steel framed mirrors and modern designer lighting fixtures. Both Novo I & Novo II offer a modern gym, sauna, social room with billiards and storage facilities. As with all homes at Univercity the Novo towers are minutes from transit and within walking distance to UniverCity's High Street Village Centre, shopping, dining & outdoor recreation at Simon Fraser University (SFU). When the need to drive arises these condos have quick driving access from Burnaby Mountain to Highway 1 and Lougheed Highway. 1001-03 9262 UNIVERSITY Crescent Burnaby V5A 0A4 : Simon Fraser Univer. 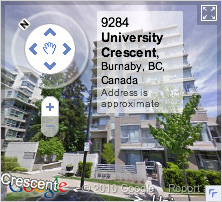 9232 & 9262 University Cres..